The other morning I took a couple of pictures of the beautiful sunrise over Texas desert… We are traveling on the Vans Warped Tour right now until mid-August and it’s keeping us busy and sweaty! Scientific and Economical Advancement or Just A Big Bluff? Prabhupada: What they have done? Tell me that “This they have done, very beneficial to the human society.” What they have done? Satadhanya: They say that they are curing disease. Satadhanya: They say that the life-span is getting more years. Prabhupada: That is another bluff. Formerly people used to live very long. Actually in this Kali-yuga the limitation is one hundred years. But who is living one hundred years? Prabhupada: Fifty, sixty… Average India, thirty-five years. In your country a little more. Nobody lives hundred years. That is also another bluff. But even if you live for hundred years, does it mean that you have stopped death? Then what is the benefit? You are eternal. Na jayate na mriyate va, na hanyate hanyamane sarire. You are eternal, but why you are dying? What the scientists have done? Na jayate na mriyate. Eternal means one who has no birth, no death. But you have birth and death, so where is your scientists’ help? Upendra: The reason the original faith was placed in the scientists was because radio, airplanes, tape recorders have been manufactured, and people are impressed by these originally. 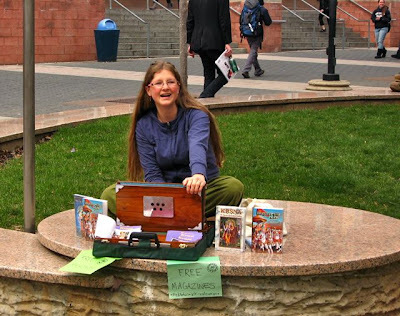 Yesterday I set up a little kirtan spot at the Temple University in Philly and chanted for a couple of hours. Maybe about a year ago we met Julie here on campus. 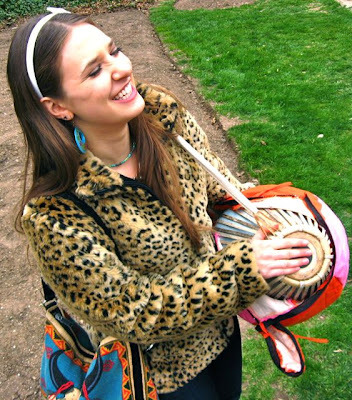 Now Philip bumped into her again and she came and rocked out with her mridanga drum. She’s one blissful girl I tell ya! A.C. BHAKTIVEDANTA SWAMI PRABHUPADA – The question is asked, “Why Krishna created this material energy which is so miserable condition?” Duhkhalayam asasvatam. So it is not Krishna willingly created. But He gave the chance to the living entities who forgot Krishna. He forgot Krishna’s service and wanted to enjoy this material world. Indriya-pritaye. Nunam pramattah kurute vikarma. Here they are doing just against the law, kurute vikarma. Karma, vikarma, and akarma. So we have very good experience, especially in big, big cities. People, just to get money they are doing so many unlawful activities, vikarma. That is vikarma. They know that “If I do this, it is punishable by law,” but still, for getting money they do that. That is the nature of this material world. For sense gratification one can do anything, risking life also. The thief is stealing stealthily, hiding and risking life to get some money. Why money? The money will supply his sense gratification.